The Mission Bubble seemingly represents a melting pot of cultures; as a place where minorities are the majority, residents believe that because they are exposed to many different cultures, they are open-minded. However, underneath the surface, our interactions between people of different races reveal an indirect bias, which creates our tendencies to discriminate against different ethnic groups within our minority community. Students may not be openly racist, but certain actions perpetuate a sense of cultural superiority within our Bubble. According to USNews, as of 2016, MSJ has a 94 percent minority population, in stark contrast to the US’s 44 percent minority population. Our microcosm is the inverse of the real world, and as a result, students do not receive a first-hand experience of the struggles minorities face outside the Mission Bubble. Direct discrimination is almost nonexistent here, which leads us to take our supposedly inclusive atmosphere for granted. Instead of banding together as a cohesive community, we choose to focus on minor differences between our cultures and races, unintentionally creating a divisive environment. 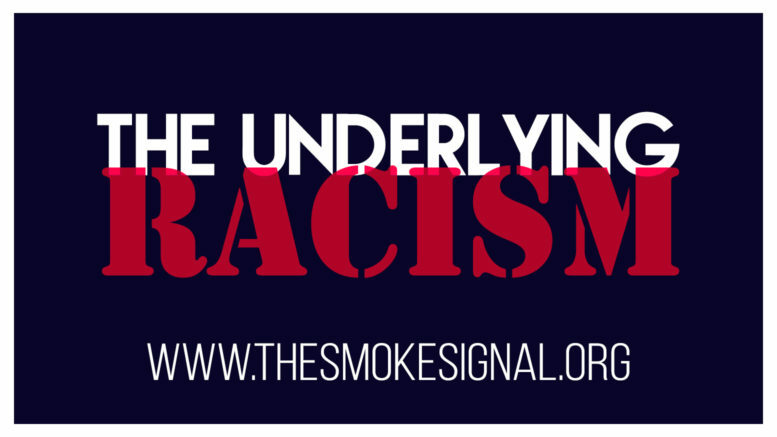 While it is fair to say that MSJ is a relatively accepting school, as people do not use racial slurs to torment others, cases of racism are laced into our everyday interactions. As a school of racial minorities acting as majorities, we inflict the same racism on underrepresented races as we would face outside of the Bay Area. For example, whenever we see someone other than an Asian succeeding in advanced STEM courses, we find ourselves feeling shocked. We see these people as an exception to their race rather than appreciating them for their hard work and achievements. This trend is also shown through the surprise we exhibit when viewing interracial romantic relationships in our community. Students often exclusively date people of their own race due to misunderstandings of other cultures, dismissing plenty of potential partners based on pure racial misconceptions. Snide comments based on facial features, religion, and athletic or academic performance in certain subjects further alienate cultural groups. Our tendency to stereotype is not unusual given that much of it stems from the cultural values that have been passed down for generations. Our parents, for instance, may have been raised in an area that was even less diverse than MSJ. As they grew up, many of their parents’ beliefs were passed down to them, including their racial biases. The transition from generation to generation creates a ripple effect of cultural values; much of the mentality that was present in the previous generation is apparent in the next. Also, because we tend to stick to the traditional values we grew up with, we find it harder to accept new ideas and cultures we encounter today. Without proper exposure to the different groups that are underrepresented, we separate ourselves with superficial stereotypes, thus leading to separations between various cultures. Even if our racism is indirect, it is important to acknowledge the issue at hand, attempt to understand each other, and work together against the bigger issues we face outside of our Bubble. These actions can be as simple as attending more cultural events, interacting with people of other races, and talking to our parents about the minor acts of racism they exhibit. MSJ can also make an effort to address this issue by holding panels to discuss experiences of alumni, current students, parents, and staff dealing with racism, as well as gaining professional insight to the problem and methods to be more culturally aware. Although some action has already been taken to combat this issue, such as discussions of cultural inclusivity in many classes and some panels already in place, it is our job to be proactive in joining the conversation. We must do our own part in helping our school become less divided by standing-up against these small acts of racism when we see them. Be the first to comment on "The Underlying Racism"